MANY RIVERS, chestnut, 2005, Storm Cat-Christmas in Aiken, by Affirmed. Stakes-placed as a juvenile and a wire-to-wire multiple winning 3/4 brother to sire Harlan’s Holiday! Flying Tee, 3 wins at 4, placed at 5, $98,700. ALBANY, CA (December 14, 2014)-Many Routes became the first winner for sire Many Rivers when he came from off the pace to win the first race Dec. 14 at Golden Gate Fields. The initial victory for Many Routes came in a $12,500 maiden claiming event by a head. The chestnut gelding is out of the multiple winner Mood Route, by Mud Route. Bred and owned by Jerry and Margaret Martin, Many Routes is trained by Ellen Jackson, who stands Many Rivers at Victory Rose Thoroughbreds near Vacaville, Calif. Many Rivers, whose fee was $3,000 in 2014, is a Storm Cat half brother to grade I winner and sire Harlan’s Holiday. He was produced by the Affirmed mare Christmas in Aiken. Stakes-placed during his 18-race career, Many Rivers has 11 2-year-olds in his first crop. Many Rivers is tail-male to Phalaris via what is arguably Northern Dancer’s most popular (at least in the U. S.) branch, Storm Bird via Storm Cat. (The other major lines are Sadler’s Wells and Danzig in the UK). 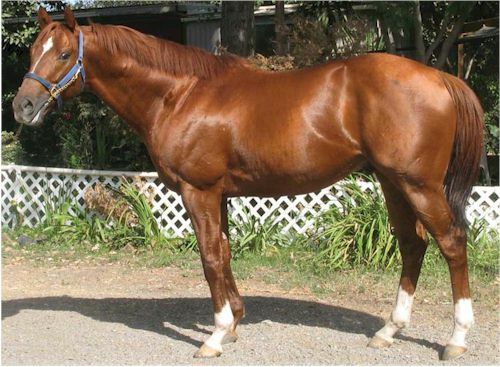 I note that Many Rivers is a chestnut and while both parents are bay, his coat color is sprinkled liberally throughout his immediate pedigree via Terlingua (by chestnut Secretariat out of chestnut Crimson Saint by chestnut Crimson Satan), and Affirmed (by chestnut Exclusive Native by chestnut Raise a Native). (A further note on his coat color: One would be hard pressed to find a better or more popular son of Storm Cat than Giant’s Causeway, also a chestnut. However, Harlan’s Holiday is a bay and he’s more closely related to Many Rivers. )Storm Cat’s remarkable tail-female line, that of Reine-de-Course Rowes Bud is one of the most potent in the stud book and it includes his close relative Royal Academy (Breeders’ Cup Mile, G1); G1 winner Crowded House, (currently in training); dam Terlingua, winner of the G2 Hollywood Lassie; What A Treat, winner of the now G1 Alabama, and dam of G2 Waterford Crystal Mile winner Be My Guest; G1 Strub winner Victory Speech; G1 Epsom Derby winner Golden Fleece; G1 Belmont winner Jaipur; G1 Santa Anita Derby winner Personal Hope; Terlingua’s full brother Pancho Villa, winner of the G2 Bay Shore Stakes; Rare Treat, winner of the G1 Ladies Handicap; Encino, third in the G2 Hollywood Juvenile plus many more too numerous to mention. By a champion from a family like this and a top runner to boot, Storm Cat was tough to ignore. Many Rivers is tail-female to the great old Maggie B. B. line via the Reine-de-Course line of Double Time/Alablue. The extended family includes G1 Santa Anita Derby winner Boldnesian, paternal grandsire of Seattle Slew; Coaching Club American Oaks (G1) winner Reviere; G1 Royal Lodge winner Home Guard; G1 Belmont Futurity winner Trapp Mountain; multiple G1 winner and solid sire Cyrptoclearance and his listed stakes winning – G1 placed son Ride the Rails (inbred to Alablue), sire of current good young sire Candy Ride; Met Mile – G1 winner Proper Reality and your own stallion Latin American, G1 winner in the Californian. Many Rivers, despite his close relationship (they are three-quarter brothers) to Harlan’s Holiday, was a very different racehorse. He was sound enough to tolerate 18 starts, not too bad in today’s racing environment. Remember that horses breed like they are bred not necessarily as they raced. His pedigree suggests he had every right to have been a graded stakes type horse and should pass those characteristics on in the breeding shed. For clients that are interested, he should show as a large-heart horse. Princessnesian is an x-factor mare. Though he is bred on a very familiar Northern Dancer/Raise a Native cross, the latter bloodline comes from the durable Affirmed and he gets added soundness from Honest Pleasure, sire of his second dam. He has no really important family inbreeding, but he has multiples of *Mahmoud (x3 via Almahmoud, Native Valor and Grey Flight, all important mares); is x2 Bold Ruler via sons Secretariat and What a Pleasure and x3 Polynesian via Native Dancer x2/daughter Alanesian. *Princequillo is also x2 via daughters Somethingroyal and Princessnesian. He’s rather versatile and I think you can find quite a few good matches for him. Storm Bird’s family line is best doubled using Battlefield, found most frequently via horses carrying Arts and Letters like Alphabet Soup. Aeneas by Capote who now stands in New Mexico, is another good source of Battlefield blood. The Northern Dancer male line is always receptive to inbreeding to his dam, Almahmoud. Major sources include Halo, Maribeau, Danehill and Arctic Tern. Storm Cat’s major relatives are all listed above – I would say Royal Academy is his best and closest match – it’s very good to double Crimson Saint, and some Encino mares might still be around in California as I believe he stood there for a time. Somethingroyal in Secretariat and her dam Imperatrice can all be doubled via lines like Sir Gaylord, Cure The Blues and Swansea in Memo of California lines. Crimson Satan’s dam, *Papila is often overlooked, but she is very potent. In California, Swing Till Dawn and Tiznow (not Cee’s Tizzy) and any full brother like Tizbud will be good sources to cross back on his Storm Cat line. Affirmed’s sire, Exclusive Native, comes from an amazing clan that includes horses like American Chance (also carrying Somethingroyal); Exclusive Ribot, King of Kings, Gold Fever, General Assembly (also carrying Somethingroyal), Charismatic, Deputy Minister and Tossofthecoin. Affirmed’s broodmare sire, Crafty Admiral, also comes from a potent line, that of Boola Brook. Look for her in lines like Red God/Blushing Groom and Beau Gar (found in Bertrando). Affirmed’s family grew stronger after his advent and good relations you can use for inbreeding include Lil E. Tee, City Zip, Ghost Zapper and Dr. Caton. Honest Pleasure had a fine full brother in For The Moment who appears in Lil E. Tee’s pedigree, doubling his worth to Christmas In Aiken. The Grey Flight line which gave us What A Pleasure, the leading sire and sire of Honest Pleasure, seems to be everywhere. Just a few places you can find her are in Pleasant Colony, Interco (who also carries Exclusive); Louis Quatorze, Bold Lad (USA), the offspring of Squan Song, Inside Information and Educated Risk, and Formal Dinner. The Alanesian line and its main members is covered above under the family notes. I believe Ride The Rails was out there for awhile and you already have Latin American, so those are two sources you could definitely explore and the former is doubled to Alanesian! Don’t forget Seattle Slew in this, as his paternal grandsire is from this family. I would not be terribly surprised if it is suggested to you that you consider lines which have worked with Harlan’s Holiday, but these seem to me to be two very different kinds of individuals. As you might imagine, you’ll find a lot of Mr. Prospector-line mares in Harlan’s Holiday’s resume but he has a good one (Tasha’s Miracle) from a Relaunch (think Bertrando and Cee’s Tizzy/Tiznow) mare, too. Plus, arguably his best offspring, Denis of Cork, has Pirate’s Bounty for the broodmare sire of his second dam and you can’t get more California than that and his top earner, Into Mischief, is out of a Tricky Creek (Icecapade-line) mare, from the same #23-B family as Affirmed, just a different branch.